If you’re an avid gambler, you’ve probably wondered countless times before if there’s a right and a wrong way to play slots. Is there some sort of a “catch” or a loophole you can exploit to claim that juicy jackpot? Since you’re here, we’d venture you googled “How to win big on slot machines” hoping to discover a hidden technique of sorts to reliably win money in a casino. Sadly, there’s no way to ‘beat’ the Random Number Generator. In the end, it all comes down to how lucky you are when you hit the “Spin” button. Now, don’t misunderstand us… This doesn’t mean there aren’t strategies you can employ to boost your chance of winning. Big wins on slot machines can and do happen. Every once in a while, you’ll read an article of another lucky gambler who became an overnight millionaire. Tilting the odds in your favor, even by as little as 0.1% could make all the difference. As tempting as they might be, no-deposit bonuses are in direct conflict with your goal here. Free money is good and all, but no casino will let you cash out half a Million dollars off of a free chip. Quite the contrary, most casinos will limit the maximum withdrawal amount while playing with no-deposit bonuses. And the sums are minuscule, with $300 being the most generous we’ve come across. On the other hand, matching deposit bonuses aren’t as limiting. Still, it’s not exactly uncommon for casinos to limit the maximum you can withdraw to somewhere around 30x the deposited amount. So if you intend to win BIG, be prepared to wager your own money. There are no “loose” or “stiff” slot machines. What people refer to when they use these layman terms is the slot’s volatility. Volatility directly translates to how often and how much the slot pays. And since your goal is to exit the casino with a bag of cash, you should find a slot with the highest volatility. You won’t win often, but when you do, the money will be good. However, be prepared to go as many as 20–30 rounds without getting a cent back. Big wins on slot machines don’t occur often, but they do happen. Some of the most memorable are certainly the progressive jackpot wins. Slots offering this type of reward to players are tempting because the jackpots often reach life-changing amounts. Progressive jackpots grow the more people bet on the specific slot. On top of that, networked progressives include multiple games, and all wagers across all connected casinos keep adding money into the pot. Although this means the jackpots will grow at a rapid pace, it also means that more players will be trying to claim the prize. Admittedly, competition in no way lowers your chances. It just means that there’s statistically more chance that someone will hit the jackpot. But if that someone doesn’t turn out to be you, it will sting. 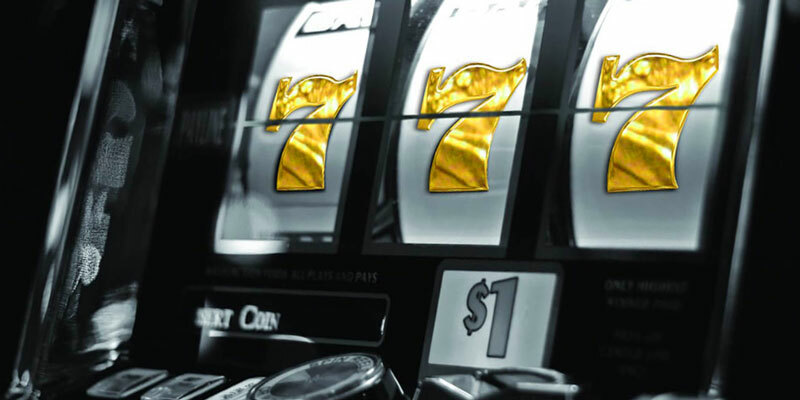 The number of paylines varies from slot to slot. If you want to follow the conventional wisdom and bet an all of them, it might take some time to find the perfect title to play. If you simply hit “bet max” without checking the number of paylines first, you might dump all your money into a single roll. There are slots out there with 100 paylines, which would require you to have a huge bankroll to pull this strategy off. But why should you “bet max” in the first place? Well, the obvious answer would be to increase the amount of potential winning combinations. On top of that, contemporary slots have bonus features that award free spins. The bet size during the free spins is equal to the bet that initiated them. Additionally, the more generous slots will also add in extra wilds, making it easier to form winning combinations. In other words, betting max on these types of slots can increase your winnings dramatically. Both online and land casinos can host a big win on casino slots. However, there are a couple of reasons why you want to choose virtual slots over real, tangible machines in land-based casinos. For starters, it’s much easier to determine the volatility of the particular slot. Even if it isn’t explicitly stated, you can always check the paytables and see how much money the least lucrative combination pays. The rule of thumb is: the bigger the payout, the higher the volatility. Additionally, any reputable online casino will allow you to check out the slots that pique your interest in “practice mode.” It’s a quick and completely risk-free way to get the general idea of how good a particular game is. Lastly, slot games at online casinos also tend to pay out more often. This isn’t just pure chance; they actually offer higher payout percentages. The RTP (Return to Player) of online slots can be as high as 98%, whereas land casinos will always offer the lowest RTP possible. This is due to the enormous competition in the online gambling world. New online casinos open almost daily. To stay competitive, veterans offer plenty of incentive to their players to ensure they don’t hop over to a different casino. And what better incentive than lowering the house edge? You probably noticed that we’ve talked more about what types of slots offer the biggest payouts, rather than how you should actually play to get that big win on them. The reason for this is simple: strategies do not matter at all. You can bet as little as $0.01 or as much as $10 per payline; It won’t change a thing. There is no way to impact the results that are randomly generated. And that’s what all slots are — random number generators with a gorgeous exterior. However, the most important thing to understand here is that you’ll statistically lose more than you’ll win. Otherwise, casinos wouldn’t be in business. However, on contrary to popular belief, the slots aren’t “rigged” not to pay. Every game house must allow you to hit that big win on casino slots. If jackpots were only a lie to draw people in, everyone would’ve given up on gambling a long time ago. 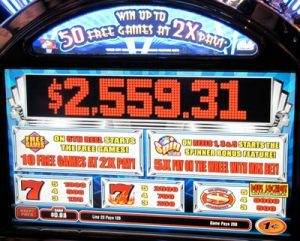 The answer to the question from the beginning – “How to win big on slot machines?” – is hit the special symbols on all reels and claim the jackpot. There’s no way to guarantee that outcome, however. Big wins on slot machines simply come down to luck. Nothing more; nothing less. So if you keep chasing after that big win, you’re much more likely to end up broke than a millionaire. Instead, we suggest you take a fundamentally different approach to gambling. View it as a fun, exciting way to pass the time, and treat every win as a welcome but unexpected bonus. Good Luck Coins © 2019. All Rights Reserved.